Always remember that your customers/users will use LBListing.com to learn more about your business, so it's important to keep your business information Up-To-Date! In order to claim your business, you will need a "Log In" account on LBListing.com, so before you follow the steps below, please make sure you have your "Log In" account. 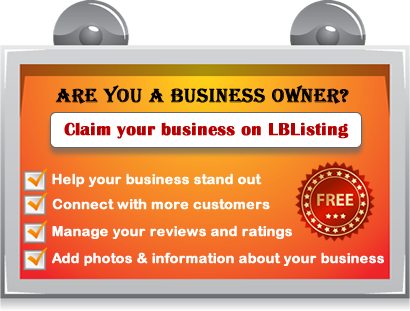 If your business is listed on LBListing.com, Please find your Business using top search engine or right side search box from top menu bar, simply type your business name or business address and select required category (if you don't know the exact category leave it as default) and click on search button. To see a page of Search results where your business should appear, open your business in detail view by clicking (Business Name, Business image or Read more link). By clicking on "Claim your listing" Button located in the middle of the page (before Map). Please "Log In" to the site if you are not already logged in. you will be redirect to the "CLAIM LISTING" Screen. From this form you can send a Claim to the Administrator by providing the proof of ownership of your listing. After complete the form with correct information about you and your business then click on "CLAIM LISTING" button. Note:-We'll get to your claim as soon as we can, though due to the high volume of claims we receive, it may take us up to a week or more to process it. Important: - If you cannot find your business on LBListing.com then you can add your business here. First of all open/select your required category under the category, there is a button “Add your listing here” by clicking that button.